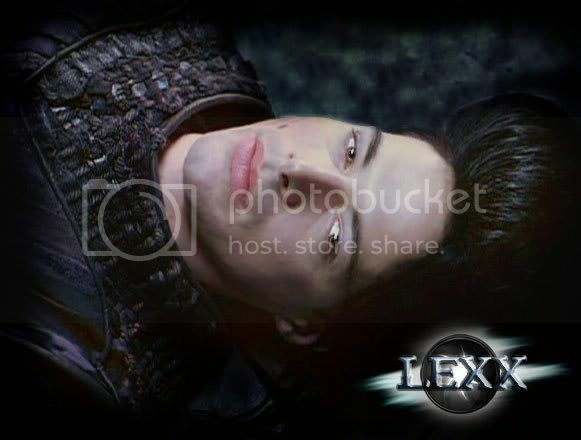 100 Things I'm Not Allowed to do on the Lexx - The Cluster - Main Lexx Discussion - You have arrived in the LEXXVERSE where the spirit of Lexx lives on. Domino's does not deliver to outerspace! Kai? Got change of a hunnred? The dead do not do anchovies! I will not have an all night Kegger party with Poetman or I may end up abandoned on a dying planet. not allowed to have a barbeque in the galley with Giggerota! ....not allowed to hang my pictures or put up any shelves..... Lexx, "ouch"
not allowed to play tic tac toe on the dead man's cyopod..no no no no! nor am I allowed to lick the glass screen either *ouch* no can I draw on the ice pornographic phallic symbols! no no no no! and no playing or pressing buttons on the control thingie ma jiggie! Ketana wrote: not allowed to play tic tac toe on the dead man's cyopod..no no no no! nor am I allowed to lick the glass screen either *ouch* no can I draw on the ice pornographic phallic symbols! no no no no! and no playing or pressing buttons on the control thingie ma jiggie! You're not allowed to have bad carrots on the menu in the Lexx galley. CARL! I'VE THE PERFECT TOILET PAPER TO MATCH YOUR TOILET! Goodness, I must be a man then. Hey don't forget to number your responses, hehe. 69. I will not add 'spoilers' and 'ground effects' to the Lexx's chasis. 70. I will not sign 790 up for 'Nailpolish of the Month' club. 71. I will not book Feppo and Smoor as a band to perform at Stan's birthday party. 72. I will not give Xev a Martha Stewart cookbook. 73. I will not change Kai's hairdo into a Flying Dutchman and enter him in the Houston Hair Wars Hairdressers competition, no matter how much he begs. 74. I will not give Prince a gift certificate for a 'Prince Albert' at the piercing parlor down the street. I will not drag race the Lexx against a foreshadow. I will not loan my LEXX DVDs to any non-fan ever again! Sorry about the brace. The dead do not clean up human remains. The dead do not poo.